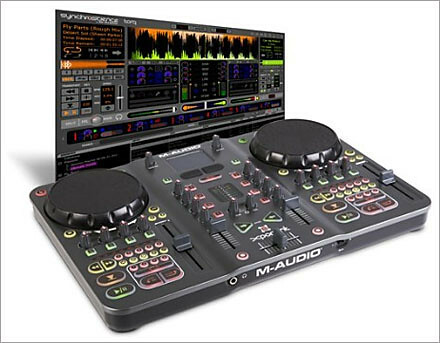 I have installed the Xponent ASIO sound card drivers and the Torq DJ software but no other software. Using Ghost I have imaged the partition to be used for easy restore before any gig so you can be sure there will be no issues. The only thing is it Torq still crashes occasionally. Sometimes the headphone channel will start crackling and the only way to stop it is to restart the Torq software. The software often will not close and the only way to fix that, is to hard restart the computer as it won’t even shut down. Too my ear the software also seems to somehow lag a bit. It doesn’t seem to be related to the Latency, and my system is plenty powerful enough, so it has got to be the software, or my ear. It is a bit strange but I need to get a second opinion on that. My friend has not had many issues with his but he is on a Mac so it is maybe more stable. The Xponent mixing surface is excellent and a lot better than the Novation Remote 25 I was using previously which was never really intended for DJ use. The Xponent is back lit – and not just the main buttons – every button. Green, Orange and Red that light up as you press them. There are LED track progress bars as well as left and right level meters. Most of the buttons are re-programmable so you aren’t stuck with someone else’s optimal configuration. The Torq software has every button mapped initially so there is no down time programming everything allowing you to start mixing out of the box. Torg is stretchable to any size as everything scales using vector based graphics so no more issues with not having wide screen skins available on big laptops. There are 20 odd skins available each giving the software a quite different feel. The interface is very well set out. The file browser has everything you need and self inputs the bpm as you load each track. The downside is that the Torq software leaves a file for each track in the same folder the track is. The bpm and track wave and cue point data is stored here I am presuming. Why they don’t use a master database file I cannot understand. I don’t need 10,000 extra files in my playlist folders! Above the browser search bar there is a 6 bank sampler where you can load bpm pitchable samples or record directly into while playing.The next row up has the level controls and the fader. I haven’t been able to locate a configuration for altering the shape of the fader cutoff which is disappointing, and the plastic cross fader on the Xponent often feels a bit light and can easily bounce off the ends if you mix too vigorously. Back in Torq there is a central two channel mixer above the cross fader with cuts for lows, mids and highs, as well as gain. There are good level indicators as for each channel. To either side are the VST effects in the lower section and the three built in effects panels above. The built in effects are pretty standard delay, reverb etc. Much more fun is to be found with the VST modules where you can load in any VST plugin and have a fully featured effects box or synth. This opens up a world of possibilities and is so much fun to use. You can easily add a new effect line to a track or pump the whole thing through a full featured equalizer. Both the effects and the VST’s can be controlled by the middle left bank of of rotary dials.There is a bank switch on the front panel of the Xponent that flips these banks between onboard effects and VST’s. For the VST’s you simply right click the button in Torq and move a midi controller in the VST and the button now controls that dial or slider. On a couple of occasions the Torq software failed to detect the midi signals for the VST until the Xponent and the PC had been power cycled. The vertical flipped sound spectrum graph makes it easy to see each track but the graph accuracy and detail unfortunately isn’t comparable to software like Virtual DJ. The graph often looks muddled and you cannot clearly see the kicks. 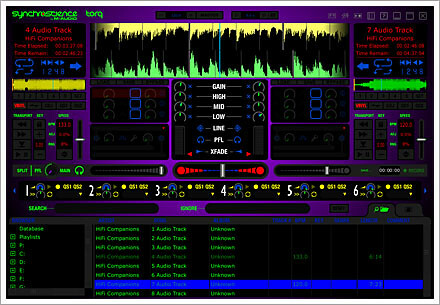 In Virtual DJ I was able to cue and beat match completely using the spectrum graph – in Torq that often isn’t possible. The few glitches are worth persevering with just for the madness of having VST’s thrown into the mix. 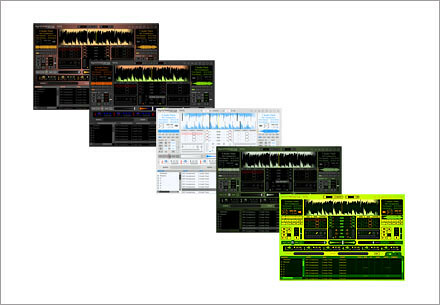 If you have been thinking of a good system for going fully digital then I would certainly demo the Xponent and the Torq software and let your creative energy start really getting into those set by remixing every track on the fly. I’m in the process of sorting my music collection and moving it to the DJ laptop. Once I have the hang of it I’ll upload some new mixes on the download demos page.